1. Preheat the oven to 160°C and place the oven rack one below middle (do this so that the coconut does not burn before the granola has baked). 2.Place all ingredient except the chia and hemp seeds into a large bowl and stir until everything is well mixed. 3. Place the mix onto a large baking tray, spread out evenly to make a thin layer, so it dries out and bakes evenly. 4. 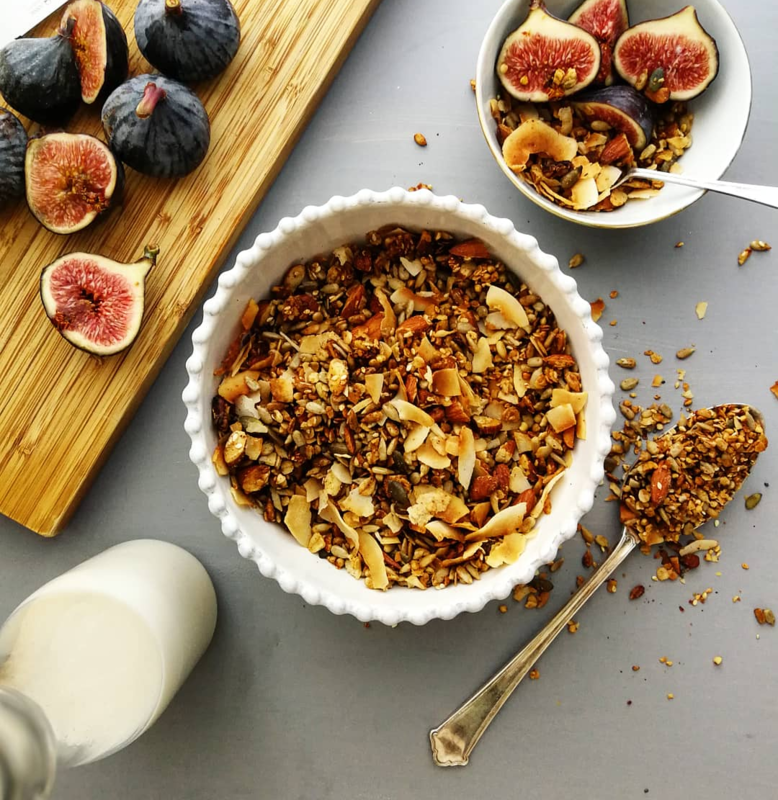 Bake for 20-30 minutes or until the granola becomes golden in colour and your kitchen smells amazing. 5. Place the tray/s onto cooling racks, sprinkle over the chia and hemp seeds and allow to cool completely before transferring into large sterilized bottles or airtight containers and store up to 2 weeks in a cool dry place (but don’t worry because it will honestly never last that long). N.B. : The granola must be completely cool otherwise it will sweat in your container and become soggy. Note: If you are wanting to ditch the carbs, then skip the oats and buckwheat and substitute them for nuts or seeds. If you are on a budget, add more seeds and oats instead of nuts as they can put a dent in your wallet. By increasing the amount of seeds you use, you will be able to bulk this recipe significantly but remember if you are bulking, don’t forget to add a little extra vanilla as you will also be stretching the flavorful if you don’t.